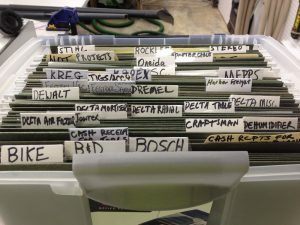 No one will argue this point: Steve Johnson, The Down-To-Earth Woodworker has a superior filing system for owners’ manuals and equipment paperwork. However, if you don’t have the space and/or energy (Steve drinks a LOT of coffee! 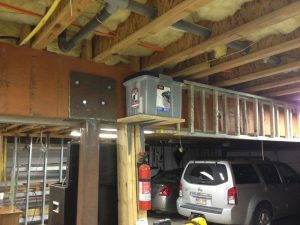 ), here is another shop organization filing system you can try. You will notice that the file box sits on a VERY high shelf. I had a system just like this before Katrina went directly over our Mississippi Gulf Coast home. Actually, I still had a system like this after Katrina, too, but it was more than a little soggy. Hopefully, if we ever flood again, it will now be above the water. I start with a Rubbermaid or Sterilite hanging file box, some Pendaflex hanging file folders and a Magic Marker or other bold-writing pen. I like a bold pen for the labels so they’re easy to see if you’re using the box in a part of the shop where the light isn’t so good. The Pendaflex system comes with top labels. This is a Rubbermaid Simplifile Box Office, but I also have a Sterilite version, and like them both. Look for the utensil storage in the lid, it’s a handy place to put a pen, pencil and Magic Marker. While there are many ways to organize the folders the important thing is to use a system that works the way your brain works, then be consistent. Here’s an example: Bill Livolsi, head of the Maker’s Hustle Podcast, organizes his shop contents by “like things.” He puts tape and glue and labels all in the same box and labels it “Sticky.” Anything that’s sticky goes in that box. The point? There’s no use in copying my system if it won’t fire a synapse in your brain. In my system one tool gets one folder. Folders are grouped together by brand. Thus, for Delta tools I have “Delta Air Filter,” “Delta Mortiser,” “Delta Radial Arm Saw” and “Delta Table Saw.” Behind that is the first exception. The DeWalt drill-driver and DeWalt planer share the same folder because their respective manuals are small. What goes in the folders? I staple the original receipt to the very front of the owner’s manual. I put the date the tool entered service on the front, too. If there is a shipping list or invoice, that goes in. Separate warranty info? In it goes! Whatever paperwork is available gets saved. Sometimes I take the owner’s manual to the band saw and slice off the non-English languages. I can’t read them, and they just take up space I can’t spare. Just be sure to leave the binding so the book will stay intact. There is a Miscellaneous folder. Some would put that folder in the front of the box because it’s not a brand, and there’s nothing wrong with that. For my brain, if alphabetical is good enough for “Bike” to “Stihl,” it’s good enough for Miscellaneous. Miscellaneous is for items with papers that don’t take up much space, like a tool that was purchased strapped to a card, and has no other documentation with it, especially if I have no other tools in that brand. After I had a few Festools, the old box was nearly full; it made sense to give them their own box. 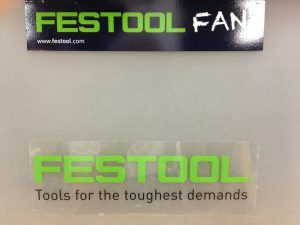 I got some Festool stickers at a Festool Road show in New Orleans. Now, it’s easy to tell which filing box is which. You could use a full-size, 2- or 4-drawer standing metal or wooden filing cabinet. That wouldn’t work in my shop, though, because I can’t spare the floor space and it would be too hard to carry upstairs in the threat of another flood. Let us know about your system in the Comments section, below. I keep all my paperwork in one of those accordion file folders. Each compartment is pre-labeled alphabetically and manuals, receipts, warranties, etc are kept together for each tool. Then that packet is filed the way my brain works…by tool type (ie: table saw goes in the “T” folder even though it is a Bosch saw). The file folder itself is small enough to occupy only a couple inches of space on my shop bookshelf.